For this challenge, we are going to cover some graph problems. We shall imagine a game of basketball or football. If we think of each of the players as nodes in a graph, we can calculate the optimal number of people to mark each of the players. Let's assume that a player at one vertex can only mark another player if there is an edge between them. So from the example graph, a player at A can mark an opponent at A, B and C. A player at D can mark an opponent at C and D. Each edge of the graph should be covered. Your goal is to provide a minimum number of players to mark all opponents represented by a graph. So, for example, one solution to this graph could be [1, 1, 1, 1] which indicates you have players stationed at A, B, C, D marking all positions, a total of 4 players. However, this would not be the most optimal. A solution like [0, 1, 0, 1] may be a better solution because the two players at B and D represented by the 1's can mark all other positions comfortably. However again it may not be the most optimal (i.e. the minimum deployment needed to mark all players). To solve this problem we shall require a function that takes a graph that represents the positions of all players on the football pitch and returns the most optimal marking strategy in the form [1, 0, X, X, ...] where the 1's represent vertices where you would place your player. We want every player of the opponent's side marked. We shall represent the graph as an adjacency matrix. For example, the above graph of 4 nodes can be represented as a 4 X 4 matrix where the 1's represent an edge between two nodes. To solve this problem, I was thinking about all algorithms related to graphs like: depth-first search, breadth-first search and Dijkstra shortest path. However, none of them was appropriate for this challenge. So I decide to go with a simple approach using loops. 1. To solve this problem we will have a function that returns true if a set of markings is a valid solution to a graph of players. 2. The second task was: Write a function that returns the most optimal marking solution for an input graph. The following function will return the most optimal marking for an input graph. To do it, we will try all possibles markings, and check if they are valid markings by using the previous function. Once all valid markings are found, we need to sort them according to the number of the element it required to achieve a full marking. The most optimal markings are the markings with the lowest number of players. 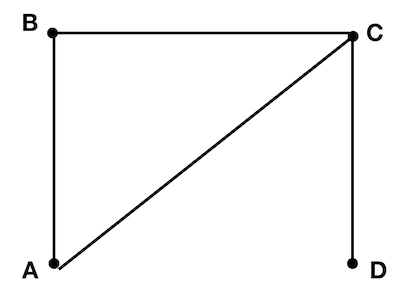 optimal_markings(graph1) is (2, (0, 1, 1, 0, 0)). I think my solution is too simple for this problem. If someone has another solution using graph theory kindly add it and explain it. So if my solution is a good one please help me to improve it for performance, readability, etc. Let's try to improve valid_markings. I got very confused by valid_markings until I understood i and j where not the index loops but the corresponding value. Depending on the context, naming your variable ì may not be a big deal but in nested loops with enumerate, it is probably better to avoid. I suggest using sol_elt for the elements of solution and _ for the value which is unused (_ is a usual name in Python for throw-away values). The 0 value as a first argument to range is not needed, you can get rid of it. Also, instead of keeping a list marked and convert it to a set at the end, you can use a set directly. Finally, because you are considering only 0 and 1, you could write if val == 1 as if val. Instead of using enumerate to get the index and iterate over both solution and graph, you could use zip. Also, instead of converting marked to a list and to compare to [0, 1, 2, etc], you could simply count its elements. Now, let's try to improve optimal_markings. combinations and results seem redundant. You generate a list of results sorted by score, take the score of the first element, get the list of results with that score and eventually get the first of that list. You could get this directly at first step. Instead of sorting all the results at the end, we could get track of the best result found so far. which makes sense from what I know of basketball. But then, from the matrix you provide which an empty diagonal, it looks like a player at A can mark an opponent at B and C but not A.
I reckon you could fix this in your matrix examples or as a special case in your case (spoiler alert: it breaks your tests in any case). Not the answer you're looking for? Browse other questions tagged python algorithm programming-challenge graph or ask your own question.